I cannot emphasize enough how important it is to have a skincare routine and to drink a crap ton of water! I wash my face morning and night and exfoliate at least once, sometimes twice a week depending on what my skin needs. I also love masking so I try to get a facial mask in at least once a week and I finally got my husband to do facial masks with me, now if only I can get him to actually wash his face regularly. S I D E N O T E : If you want to see how I remove my makeup, check it out here and these are my current top facial masks here. Skin Type: I have oily/acne prone skin with a dry under eye area. Shea Moisture African Black Soap Clarifying Facial Wash & Scrub: This is the gentle exfoliating wash I use on days that I want to exfoliate. 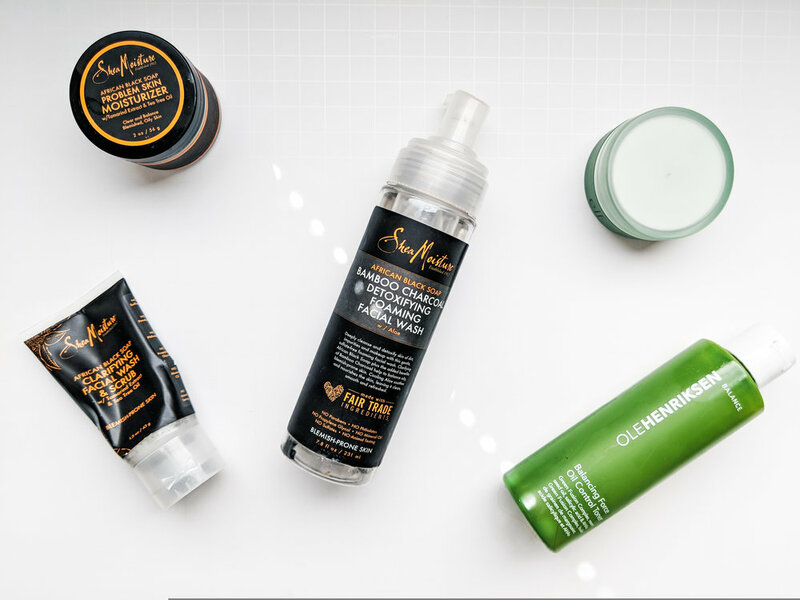 Shea Moisture African Black Soap Problem Skin Moisturizer: This is a thicker type moisturizer so a little goes a long way. *Disclaimer: I believe sets of products are meant to be used together and are more effective. e.l.f Illuminating eye cream: This stuff I have been using forever and is very lightweight and moisturizing for my under eye area. It’s not my all time favorite but it does the job on a budget. Olehenriksen Balancing Force Oil Control Toner: This is a new found favorite and I am obsessed. I have been using it for about 4 months and this is actually my second bottle of it. It feels nice and refreshing on the skin and is not harsh at all. I have used the other products in the balance line but the toner is what really gets me.